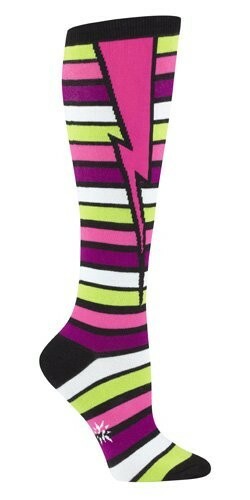 Sock It To Me Stripe and Bolt Knee High socks feature a large pink bolt of lightning and stripes of green, pink, and purple. They won't question your girl power when you put them on - just try them out for yourself! One size fits most. 75% Cotton, 20% Polyester, 5% Spandex.